Boat lifts make an excellent investment for watercraft owners. By keep your boat hoisted on a platform while it’s not in use, you’ll prevent the deleterious effects of extended saltwater exposure, such as organism growth, corrosion, and blistering on the hull. Typically, a lift system is suspended between a set of at least four pilings that have been driven into the sea floor. However, in areas with coral substrates such as Islamorada, Florida, pilings can’t always be used. Fortunately, DECO Boat Lifts offers top-of-the-line boat elevator systems that can be mounted directly to the seawall, allowing watercraft owners to get all the benefits of a lift system without the use of pilings. To meet the unique needs and budgets of our customers, DECO Boat Lifts offers boat elevator lifts in two distinct configurations. For those looking for a reliable lift at an affordable price, our Maxi Lift is the ideal choice. It’s built with premium materials, including marine-grade aluminum with stainless steel components to prevent corrosion, and it has a heavy-duty flat plate aluminum drive system, making it suited to a wide range of vessels. We’re also proud to offer boat elevators with our Concept CRS Lift – the most advanced lift system in the industry. Its direct drive system delivers incredible lift operation without the use of belts, pulleys, or chains, significantly reducing maintenance. Plus, it comes standard with our patented Cable Retention System (CRS), which has deeply grooved winders to eliminate instances of destructive cable overlapping and spooling. 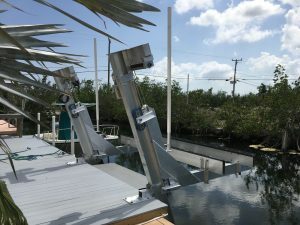 Learn more about what makes a boat elevator from DECO Boat Lifts the perfect option for your waterfront property in Islamorada, FL. Contact us today.